Kawanna Brown knows what it?s like to have someone believe in her, to notice her hunger for opportunity and sense the fire in her belly. Earvin ?Magic? Johnson knew he had a winner on his hands when he hired Brown?whom he fondly calls ?Queen? ?in 1996 to be his executive assistant at Magic Johnson Enterprises in Beverly Hills, Calif. ?His incredible guidance, vision and confidence in me gave me the ability to achieve high in my career,? says Brown, 32. ?I am a humble high-achiever in every aspect of my life.? Along with the nickname came a steady series of promotions, including one to the presidency of the Magic Johnson Foundation, before she landed her current role as chief operating officer. In that position Brown works hard at building the Magic Johnson brand, brokering deals that involve licensing, endorsements, asset acquisitions and partnerships with companies, including Lincoln Mercury, Burger King, Samsung and Best Buy, to name a few. She is also responsible for overseeing the company?s general operations. ?I am a first-generation graduate from a college or university [in my family],? Brown says, proud of the bachelor of arts in sociology, with a specialization in business administration, she received from UCLA. When she was president of the Magic Johnson Foundation, her passion for educating young people drove her to increase the foundation?s exposure among nonprofit organizations, especially those dealing with education, health and social needs. For over a decade, Brown has been an active mentor to inner-city teens and college students across the country, and she currently serves on the board of Educating Young Minds. 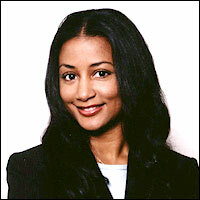 In 2004, she, along with her boss, served on the Executive Steering Committee for Diversity at NASCAR. Her favorite quote is by Maya Angelou: ?If you don?t like something, change it. If you can?t change it, change your attitude. Don?t complain.? If she had the time and money, Brown would travel to Africa to assist in eliminating the AIDS pandemic on the continent.